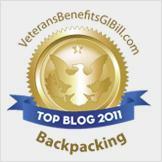 A couple of days later, while I am surfing the social networks I see that some fellow bloggers have happened to end up on a top 50 backpacking blog list hosted by veteransbenefitsgibill. I don't know if this one is doing the same thing about widdling down to the best to award a gift card or not but can you see a pattern starting to form here? By the way, somehow we didn't make this list, I can only assume that it was because we don't have much in the way of backpacking on the blog yet, maybe in 2012 we will make the list (insert maniacal laughter here). This brings me to today. Again I'm surfing the social networks and I notice that someone has posted about making the top 50 hiking blogs. What do you know? I go there to check it out and sure enough we made this list and once again there is a badge for all of us to display on our sites with a link back to bachelordegreeonline. Hmmm. Now my Spidey sense are running all amuck over this, as if they weren't already heightened after the first award. So I'm beginning to wonder who exactly is behind this and am a bit curious to know their reasoning's behind such a caper. Of course deductive reasoning leads me to believe that the perpetrators are trying to gain more traffic to make money or something of the like through advertising. Just looking at the website URL's and the pages themselves, it's all about getting traffic to make money. Of course they are linking to us, but I'd rather not be associated with such a scam. So I've decided not to add the award badges to our blog and me thinks the rest of the hiking, backpacking, and camping bloggers out there shouldn't either. To me it says something negative about our credibility if we allow these click scams to operate through us. I guess the prevailing wisdom that comes through to us in all of these is the following saying we've come to live by over the past few years and it is this: "If it's to good to be true then it usually isn't true." Update: It appears that the Just Backpacks Best Camping Blog contest appears to be legit for intents and purposes and for a $100 amazon card and possible more, we've decided to show that we've made it to the Top 50 and waiting to see if we make it to the top 25.